There’s a big change coming and it’s going to be truly transformative. The BMMI Group, through a collaborative team, is launching Employee Self Service HR for all its operations by the middle of this year, taking a huge step into digitalising and automating processes. The Corporate Communications and Marketing team recently sat down with three key people behind the project to learn more about it. 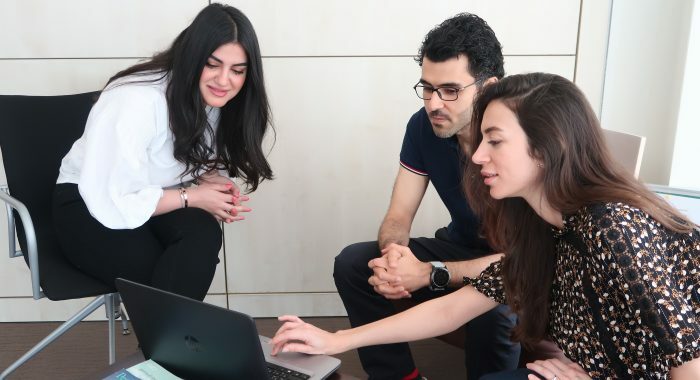 Marwa Rasti, Senior Manager of Human Resources Operations - GCC, Aiman Alorayedh, Head of Information Technology, and Sarah Al Sairafi, Senior Manager of Corporate Talent Management, discussed the aim, implementation and change that comes with this project. So what is the Employee Self Service HR project all about? Under this programme, we’re integrating a lot of the HR processes in one automated system. It’s a very critical and exciting implementation, it will transform how we provide services to our internal customers, and it will also transform the structure and function of our HR team. Employees now will be able to have access to their information through one hub, rather than dispersed sources that might not be as timely or accurate. It’s all about empowering our employees across the board and across our countries of operation. How will this project help empower our people? Firstly, the new system empowers our employees because it is all about managing your own information and having it easily accessible and visible to you. Whereas previously you’d have to go through a lengthy process, contact people and gather information, whether for yourself or if you are a manager, for someone in your team, the new automated system now streamlines the process and puts the power in your own hands, increasing the productivity and efficiency of all stakeholders across the board. In terms of the HR team, this project also truly empowers us. We will no longer just be administrators who receive requests and execute them. By automating this part of our processes, it allows us to become even more valuable business partners who work on an advisory level. We will be managing people, data and information and we will be heavily involved in analytics. This will allow us to offer even more crucial support to the business and management in coming to the right decisions and increase service level expectations, while also fine tuning the accuracy of our data. It sounds like the implementation of Employee Self Service HR is quite a big change. From a change perspective, it’s quite radical. You have a function that is used to managing things administratively and will not be doing so anymore, but employees who will be empowered to retrieve information independently when that was not possible before. Some people worry about change and progress when it comes to automation, but truth be told, this actually creates opportunities for new roles, including a major skill upgrade. HR employees will no longer be administrating and will be required to learn new skills in order to be able to fulfil the new opportunities the automation can present, including for example data analytics, consulting and advising, and improving their communication with our internal customers. How has the team welcomed the beginning of this project? This has been a long time coming, and the team is excited! The HR team has been heavily involved from the start, at the end of the day, they are the subject experts on these processes and have been advising our consultants along the way. They have all, in addition to the IT team, been integral to the processes, from recommending best practices, to conducting background studies and information gathering. We are really excited at the prospect of how our responsibilities are going to evolve and transform and we are ready for this new challenge! The team’s infectious enthusiasm remains a hugely crucial element to the success of this project. The people behind the scene who are testing the new processes and who are involved every step of the way will be our biggest champions in spreading this enthusiasm to the rest of the organization. We are blessed that we have a team that is both accepting and excited by the changes coming ahead. You sometimes hear about people being worried about automation and changes that come with it. So, have you not experienced that? We live in a world where we literally cannot avoid technology and the more we put it off, the more work we have for ourselves to catch up. The best thing to do is ride the wave each time it rolls in and learn all the new things that come along with it. Again, we are lucky to work for an organisation that advocates innovation and that advocates technology and its adoption. Most importantly, we’re lucky that our people remain open and accepting to change. They are definitely problem solvers who always seek out opportunities to better themselves and how we do things. That’s right - the implementation of this system is a huge, huge deal that will literally not only transform HR but also BMMI in terms of our technology and services. Our people are excited by that, and by the prospect of increasing their customers’ satisfaction and enhancing their own careers. Besides empowering our people, are there any other benefits the new system will present? Besides boosting internal customer satisfaction through faster and more streamlined processes, the system also offers enhanced security of data, with strict security measures and protocols in place that will further support the privacy and confidentiality needs of our employees. Additionally, it takes the burden of monotonous and tedious tasks off the shoulders of the HR team, which will help with efficiency and engagement. The system will also assist in preventing wasting our resources, whether it’s time, talent and very importantly paper! With the new system being entirely paperless, and the fact that we have over 11,262 transactions processed on average per year, this saves us a ton of paper that HR would’ve used annually for these processes. That’s a great CSR milestone for the Group!